Book Corner: The Holy Lance – History… the interesting bits! It’s 1191 and Richard the Lionheart is leading the Crusaders against Saladin’s Muslim army. The Holy Lance by Andrew Latham is a fantastic piece of fiction. From the first page, you are drawn into the final battles of the Siege of Acre. English Templar Michael Fitz Alan leads his men to victory in a counter-attack against the Saracen army, saving the Crusaders from defeat. As part of the peace negotiations, Richard has demanded the return of the fragment of the True Cross, in Saracen hands since the Crusaders’ defeat at the Horns of Hattin. However, Richard decides against putting all his faith in the return of the True Cross, and sends Fitz Alan on a quest to retrieve the Holy Lance – the lance that pierced Christ’s side while he was on the Cross. Fitz Alan and his hand-picked team of Knights Templars journey through hostile territory, battle Saracens and face down Assassins, to complete their quest, all the time guided by a Knights Hospitaller priest they just don’t quite trust…. 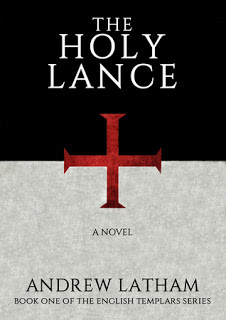 Andrew Latham’s The Holy Lance is a wonderful story, filled with action, intrigue and adventure. Set during Richard the Lionheart’s Third Crusade, the action is fast and furious; the battle scenes are frantic and vivid. The novel is full of political intrigue and hidden agendas; Fitz Alan never knows quite who to trust, except his faithful Templars. The book works on many levels. The tension is palpable. The success of the mission is in no way guaranteed….. Fast-paced and full of suspense, the story is absorbing, and draws you in. As if without trying, the author gives you a good grounding in the history of the Holy Land and in the differing objectives of the various combatants. There are some minor spelling errors – such as the use of ‘there’ when it should be ‘their’ – but they don’t detract from the story and after a while you don’t even to notice them. Every paragraph and chapter is filled to the brim with amazing detail, keeping the reader absorbed to the point that time just drifts away…. The book’s hero, Michael Fitz Alan, is a wonderfully complex character, with a past that is frequently alluded to, a man of the world who dedicated himself to the Fellow-soldiers of Christ and the Temple of Solomon, becoming one of their most effective captains. There are hints from the beginning of some sort of disagreement between Fitz Alan and Richard I – just enough teasing to get you curious. Fitz Alan is a model Templar Knight, trying to make amends for something; his desire to leave the material world behind and his past experiences clearly direct his current actions. Andrew Latham has made his character incredibly human, susceptible to doubts, fears and prejudices. He begins to learn that the Holy Land is not as black and white/good and bad as he thought before he arrived. A very likable character: you find yourself egging him on, wanting him to succeed. All the lead characters of the Third Crusade have their parts to play. The portrayal of Saladin is surprising – and refreshing, looking at the Muslim leader from a whole new perspective. Richard the Lionheart is portrayed as the hard soldier you’d expect, with an intelligence which allows him to deal with the machinations of the incumbent Western leaders, Conrad of Montferrat and Guy de Lusignan. The relationships of all involved are deep and complex, but explored with such energy and passion, you almost feel you know them personally. The novel provides a great depiction of the Third Crusade and of the motivations of the various combatants. The Templars and their rule are sympathetically and accurately depicted – the hard, trained knights and sergeants who fought for God and each other, while following monastic rules. You can almost feel the heat of the Levant’s sun and hear the sounds of battle. The battle scenes are marvelously choreographed; they are hectic and realistic. As a debut novel, Holy Lance is incredible. It is one of those amazing books that grips you from the first page and won’t let you go until the last – and yet you never want it to end. Great as a stand-alone novel and yet, as the first in a series, it leaves you eager to read the next installment. Article originally published on The Review in July 2015.